Flock of Blue-and-yellow Macaw (Ara ararauna) in flight. 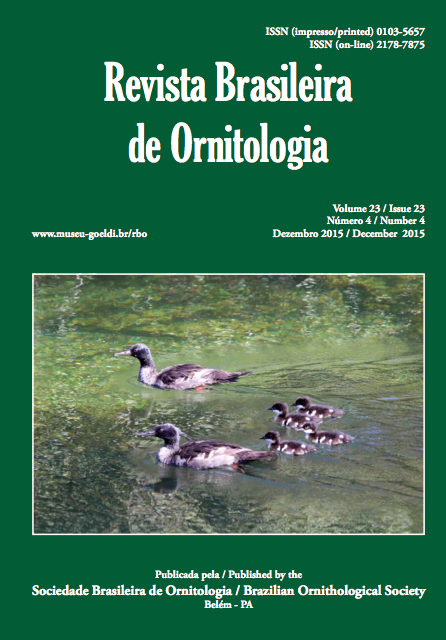 De Araújo et al. 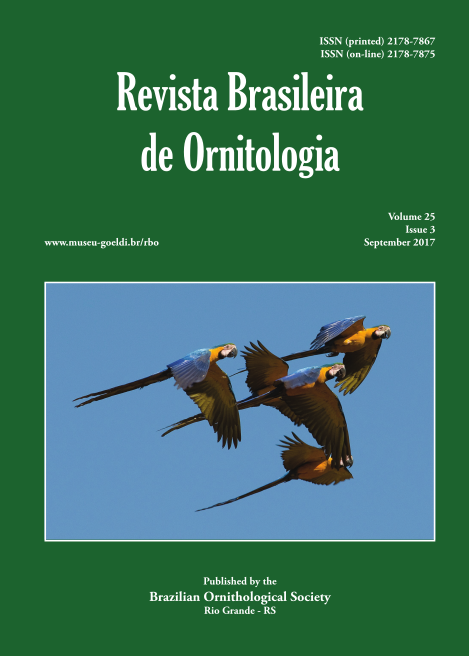 (in this issue), investigated species-specific variation in flight-calls in ten parrot species in central Brazil, associated with social functions and phylogeny. Photo author: Kjell-Ove Holmström. Nestling of Yellow-olive Flycatcher (Tolmomyias sulphurescens) preyed by a Eastern Green Whiptail (Philodryas olfersii), removed from the nest. 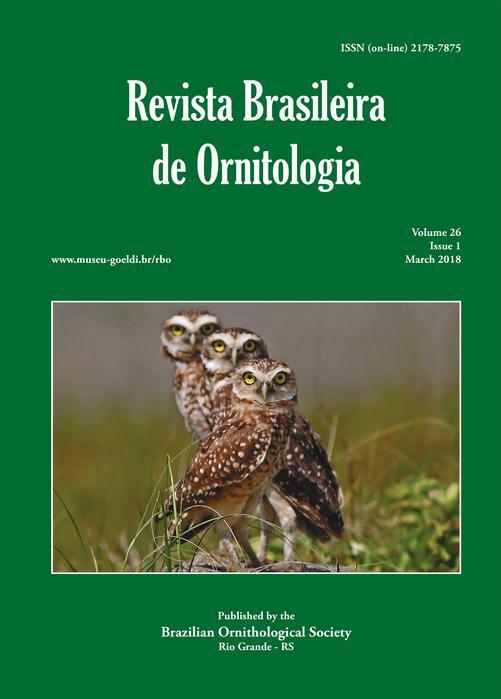 Marini (in this issue) provided a comparison of nesting success and predation levels of eggs and chicks in open cup and closed nests of Passerines in an Atlantic Forest fragment in Brazil. Photo author: Nicelio A. da Silva (http://www.wikiaves.com.br/ 1276721). 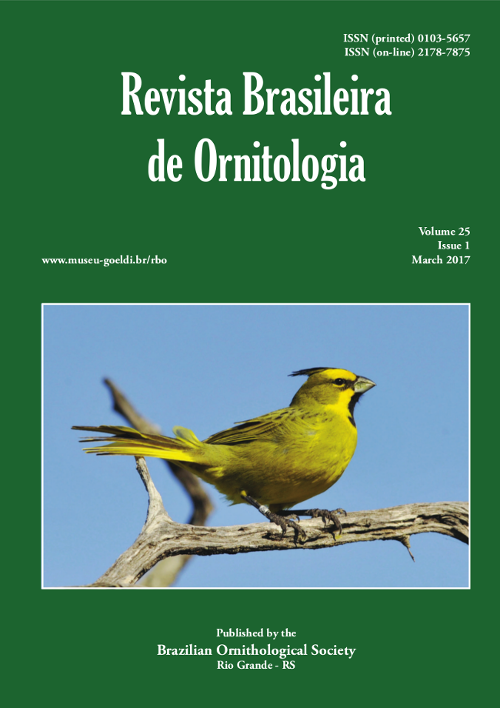 Adult male Yellow Cardinal (Gubernatrix cristata) at the Espinilho State Park, Rio Grande do Sul state, southern Brazil. Beier et al. 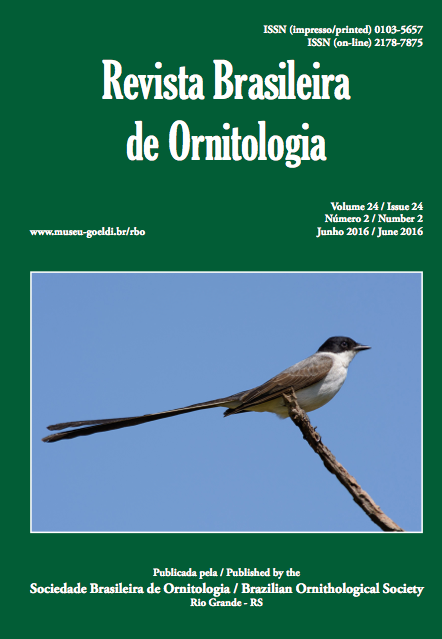 (in this volume) provides information on social organization and breeding parameters of this threatened species. Photo author: Márcio Repenning. Cinnamon-throated Woodcreeper (Dendrexetastes rufigula) photographed near Manaus, Amazonas, Brazil. 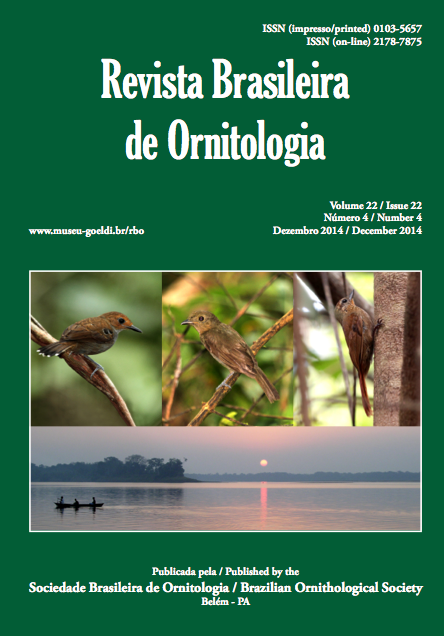 In this volume, Ferreira et al. 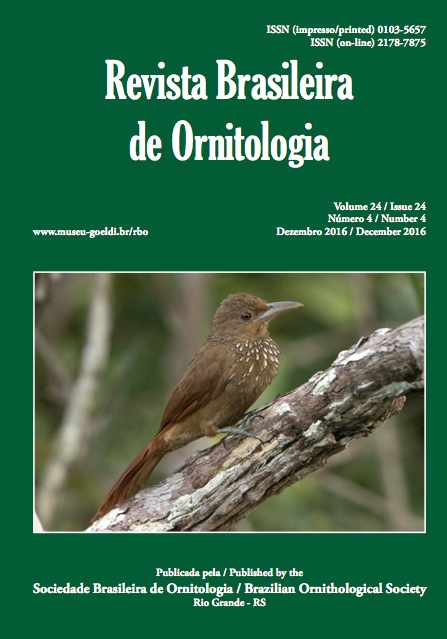 present a systematic review of the Cinnamon-throated Woodcreeper based on molecular characters. 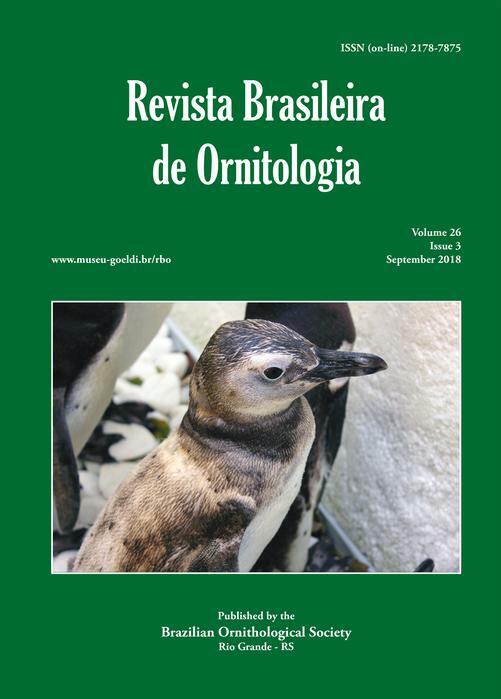 The authors recommend the recognition of two additional species formerly regarded as subspecies, D. devillei e D. paraensis, which are also fully diagnosable by plumage characters. Photo author: Luiz Ribenboim (http://www.wikiaves.com/1967950). 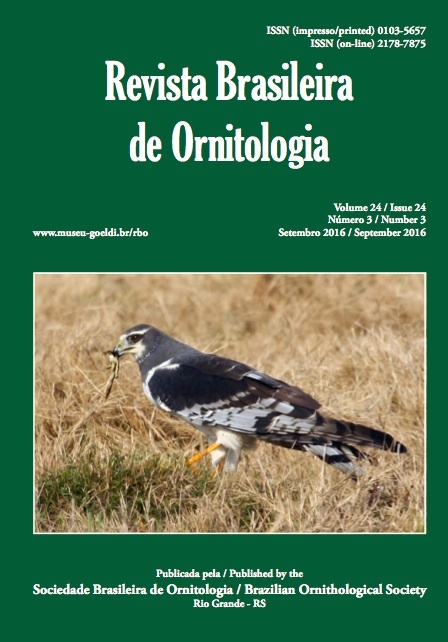 Adult Long-winged Harrier (Circus buffoni) predating an amphibian in the Pampas grassland of Uruguay, in August 2010. Baladrón et al. 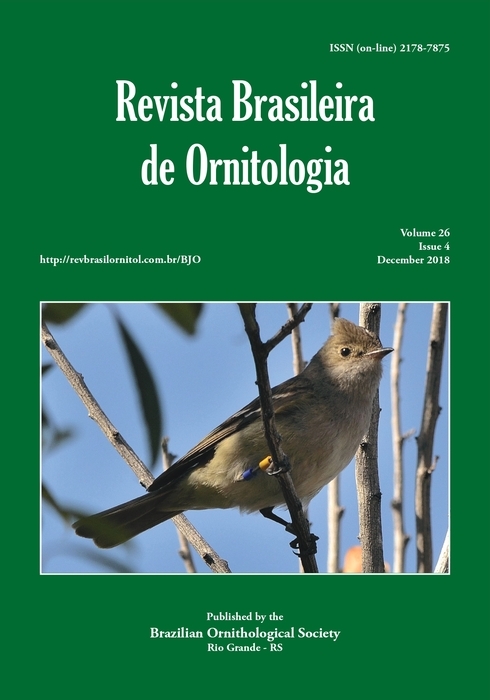 (in this volume) provide an activity budget and descriptions of hunting behavior of the species, in comparison to Roadside Hawk (Rupornis magnirostris) in the Pampas region of Argentina. Photo author: Alexandre T. Faitarone (http://www.wikiaves.com/192949). Fork-tailed Flycatcher (Tyrannus savana) photographed at Itirapina Ecological Station, São Paulo state, in September 2010. Males were tracked during a whole year with geolocators, and their staging and wintering grounds identified. Photo: José Carlos Motta-Junior. 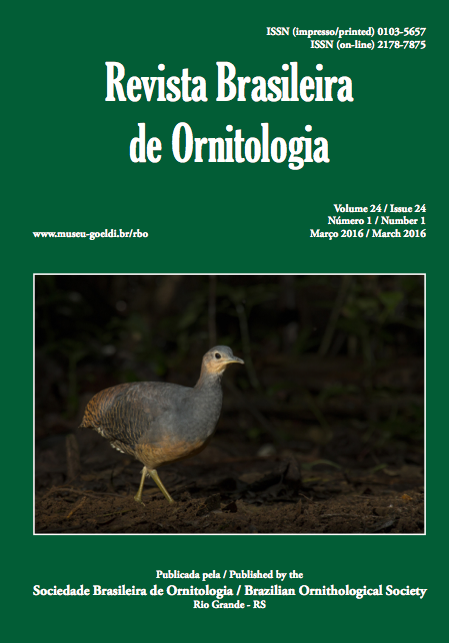 Yellow-legged Tinamou (Crypturellus noctivagus). Photograph taken at Joinville-SC in 17 May 2015, using blind and flash. Author: Valdir Hobus. Pair and nestlings of Brazilian Merganser (Mergus octosetaceus) swimming together on the clear waters in the region of Serra da Canastra-MG, Brazil. 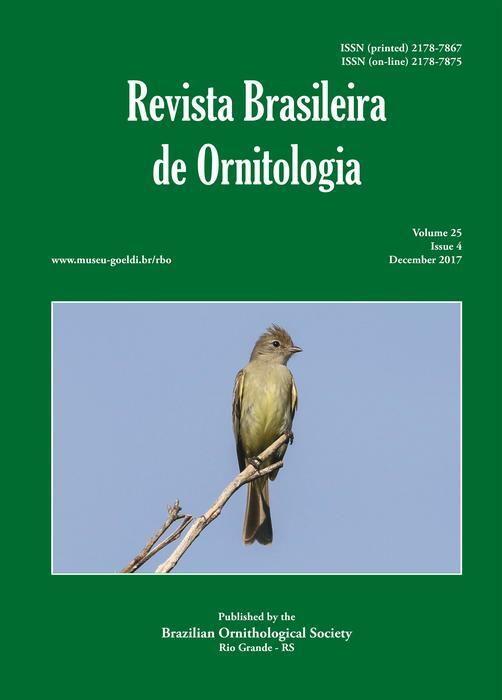 In this volume, Barbosa et al., present population and habitat selection data for a disjunct population of this critically endangered species from the Jalapão region, state of Tocantins. Photo: Sávio Freire Bruno. Mangrove Rail (Rallus longirostris) photographed along the southern expressway in Florianópolis, Santa Catarina, while searching for crabs in an urban mangrove. 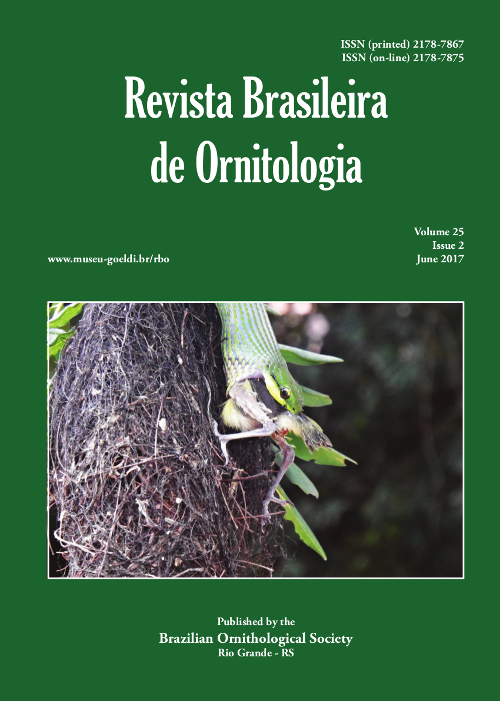 In this volume, Vieira reports on an interesting case of increasing population sizes of this species associated with mangrove expansion on the Island of Santa Catarina. 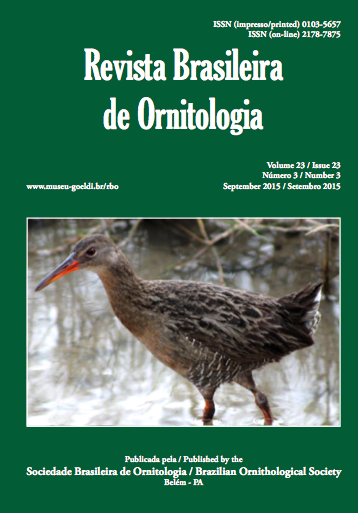 However, the author presents data supporting the classification of the Mangrove Rail as Vulnerable at a global level due to overall decline of the area covered by mangroves in South America. Photo: Bianca P. Vieira. 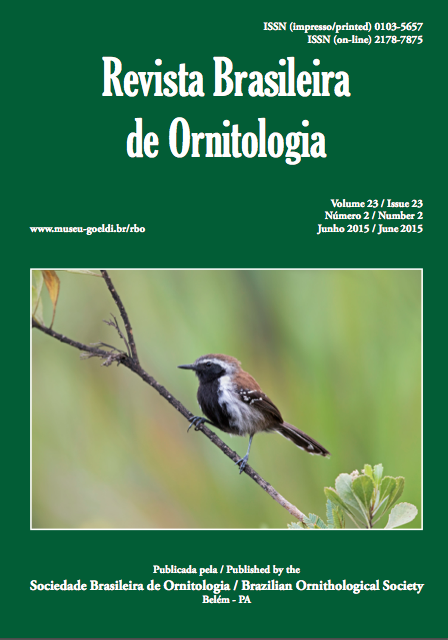 Male Sincora Antwren (Formicivora grantsaui), a threatened new species described in 2007 and named after Rolf Grantsau, a pioneering ornithologist in Brazil whose obituary is published herein. This species belongs to the Thamnophilidae family, a group targeted by an extensive series of studies ranging from behavior to systematics carried out for over 40 years by Edwin O. Willis, whose obituary is also published in this volume. 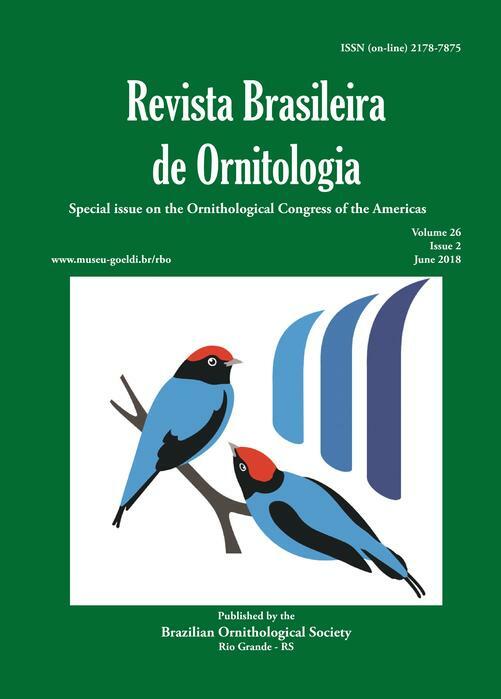 We dedicate the new Annotated Checklist of the Birds of Brazil published in this volume to Rolf Grantsau and Edwin O. Willis, therefore honoring their ornithological legacies. Photo: Ciro Albano. 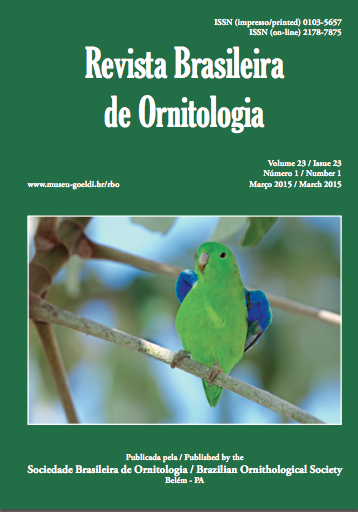 Male Blue-winged Parrotlet Forpus xanthopterygius, a polytypic and widely distributed species in South America and whose taxonomy is revised in this volume by Bocalini & Silveira. Photo: Edson Endrigo. 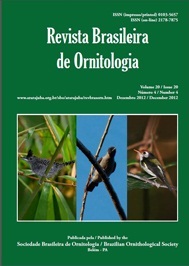 Species of birds responding to the “barrier effect” of rivers in the Madeira drainage, Amazonian Brazil, as documented by Fernandes et al., in this volume. Top left: Immature male Common Scale-backed Antbird Willisornis poecilinotus (photo by Anselmo d’Affonseca); top center: Thrush-like Mourner Schiffornis turdina (photo by Alexander C. Lees); top right: Wedge-billed Woodcreeper Glyphorynchus spirurus (photo by Anselmo d’Affonseca). Below: View of the Aripuanã River by sunset (photo by Alexandre Fernandes). 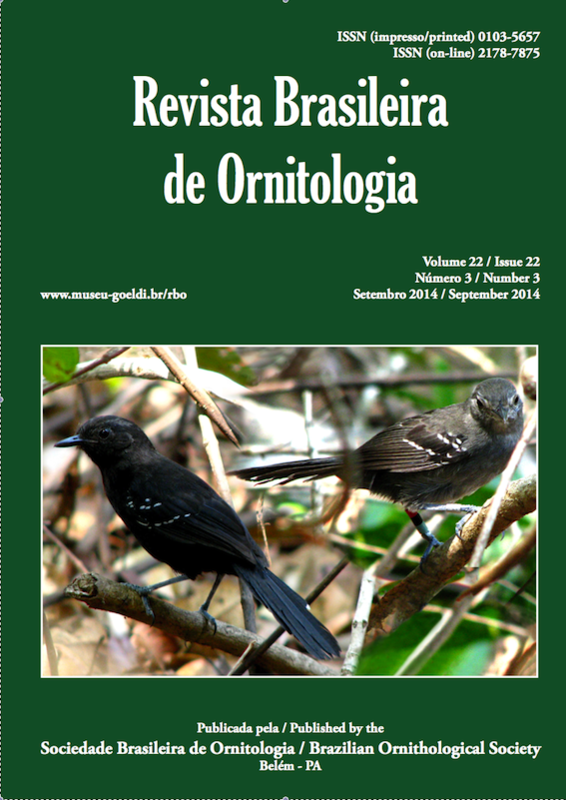 Pair of the Mato Grosso Antbird (Cercomacra melanaria; male to the left and female to the right), whose breeding biology is documented in detail for the first time herein by Bernardom et al. Photomontage based on Aldo Ortiz pictures.